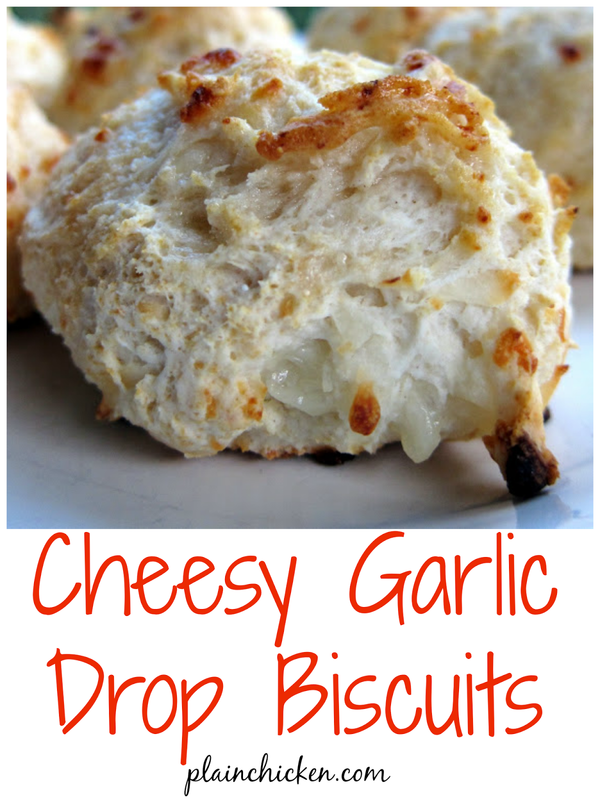 Cheesy Garlic Drop Biscuits - only 4 ingredients! Ready to eat in under 10 minutes! I needed a quick bread recipe for our Lemon Alfredo Pasta the other night, and this easy recipe from the side of the Bisquick box was perfect. The original recipe was only Bisquick and milk. I wanted a little more flavor, so I added mozzarella cheese and garlic. They turned out great. They were exactly what we were looking for to go with dinner. Bake 7-9 minutes or until golden brown. I mean, right on for your pasta dish. Holy cow these look good! I'll have to try these on our next pasta night! Yum!! I don't think I've seen these done with mozz before, but how could that not be good?! Haven't meant to be a stranger lately, so thanks for stopping by to visit. I've had a bit of spring cleaning/spring fever the past few weeks, so haven't been blogging or visiting much.